If you give birth in the Spring, you will be able to find fresh stinging nettles at the farmers market! 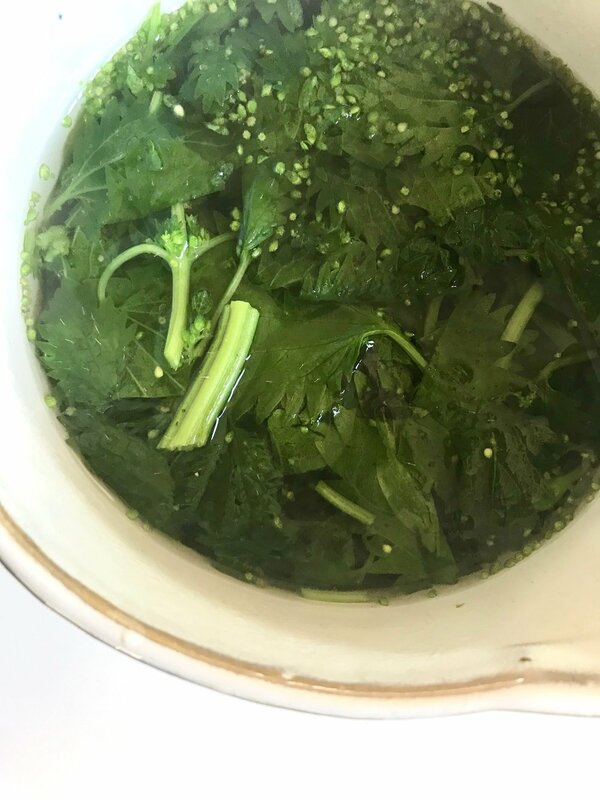 If you’re pregnant, but aren’t due until after spring then you can always make fresh nettle tea (or soup!) and freeze it for up to 6 months. Simply stick it in your fridge for a slow defrost and then gently warm it on the stove when you’re ready to consume. You can also buy dried nettle leaves, just be sure they're from a high quality source. Because nettles will sting your skin, they can be tricky to handle. Make sure the farm stand you buy them from wraps them in a plastic bag for you. When you get home, put on some clean kitchen gloves and pull out the stalks from the bag. Do your best to pull off all the leaves. Then, using some clean kitchen scissors, chop off some of the tops of the stalks. Maybe go about halfway down. Take all of that and put it into a large bowl. While you prep the plant, have a large pot of water (about 8-10 cups) coming to a boil on the stove. Once the water comes to a boil, turn the heat down to simmer and add the leaves and chopped stalk. Let it steep for 10-12 minutes and then you’re ready to enjoy a cup! Strain the leaves out and pour the tea into mason jars. The tea will keep for about 3 days in the fridge so I recommend freezing whatever you think you’re not gong to drink in 3 days. Nettles are amazing because they’re very high in iron, very mineral rich and aid in milk production. Nettle tea also promotes hair growth which is especially wonderful when you get to the stage of postpartum hair loss. All around perfect for new moms! *when purchasing, be sure to get nettles that have not yet gone to flower. Once the plan starts flowering, it can be hard for on your kindness to drink the tea/soup. The farmers should be able to tell you whether the plant has gone to flower.